From stovetop to oven to grill—even on a campfire—this ceramic, non-stick grill pan cooks virtually anywhere. Little Griddle skillets and griddles are made from a lightweight, food-grade aluminum that’s coated with ceramic. The glossy finish keeps food from sticking and it’s easy to clean, too. The designers thought of everything they would want in a pan, then took three years to engineer it. They used materials that would be light but still retain heat and distribute it evenly, whether on your stove or a grill. And they made it easy to cook and to wash, whether you’re indoors or out. When we tried these pans out, we were hooked. Their all-terrain design makes cooking better at home and anywhere else you roam. Hi Everyone! 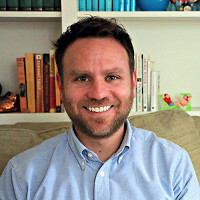 I'm Jon Stein from Little Griddle, and I am really pleased to be able to share our new ANYWARE cookware with fans of The Grommet. I love to cook and good food is very important to me, and I created ANYWARE to give people quality cookware that would really cook anywhere, from grill top to stovetop. Thank you for checking out our launch and I'll look forward to your comments and questions! I purchased one of the new ANYWARE skillets from Little Griddle about a month ago and am so glad I did! I have always had an issue cleaning up eggs and other similar dishes with my other pans, but this pan practically cleans itself! Nothing sticks to it and I waste no time at all on clean-up. Plus, it cooks my food quickly and evenly and everything comes out tasting delicious! I'm so happy with this product that I just purchased 4 more for my extended family members! Best pan I've ever had...hands down. I would highly recommend! @Melissa I'm the person in the video, who did the testing. I had the same experience in terms of ease of cleaning up normally difficult dishes, like eggs. Win! Hi @Melissa - thank you so much for your purchases! We really tried to make something special with ANYWARE, and I'm glad that you are having such a good experience with our products! From the videos, it looks like heat will transfer to the handle... is this the case ? do you need to use something to protect your self from boring when moving them from the heat source ? @Hiram Yes, it does get hot and you need an oven glove or hot pad or towel to enable safe handling of the Little Griddle. Hi @Jules, @Hiram - Just a note on "the why" around the handles: in order for this product to be grill- and campfire-suitable as well as great indoors, we could not use handles that would be affected by the high heat levels of cooking out-of-doors. Therefore a mitt or hot pad is required when you want to move a hot pan. Can these be used on induction cooktops? Hi @Susan - ANYWARE cannot be used on induction cooktops. It is made for grill, gas- or electric-stovetop, campfire, and oven. 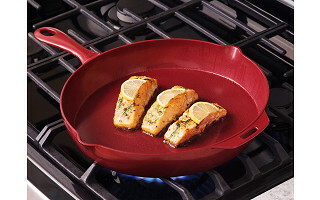 Look for induction-ready cookware from Little Griddle in the future! In the meantime, it's awesome to use elsewhere. Thanks! @Jon Hi Jon - Just to be clear, can Anyware be used on standard radiant cooktops like the GE Profile model JP340? Hi @Raymond - ANYWARE can be used on this cooktop, or any glasstop electric stove that uses conventional heating elements. It will not work with induction cooktops at this time. can you tell me where the pans are made? Hi @susan - ANYWARE is manufactured in China. Does the ceramic coating scratch over time, degrading its non-stick qualities? What sort of utensils must be used? Hi @David - We recommend wooden or silicone cooking tools at all times, because metal tools can scratch the ceramic surface. Ceramic is an extremely hard surface, but it can be scratched with rough tools. ANYWARE is extremely durable and comes with a limited lifetime warranty against manufacturing defects, but hand-washing and using the right tools are the best care for the cooking surface. Is this non-stick surface "green? 'In other words, is it safe? What is it made of? Hi @mindy - ANYWARE is made from durable and lightweight food-grade cast aluminum with an advanced ceramic nonstick coating. ANYWARE™ does not contain PTFE or PFOA, and it features a tough, beautiful ceramic surface for high-temperature cooking up to 525° F (270° C). 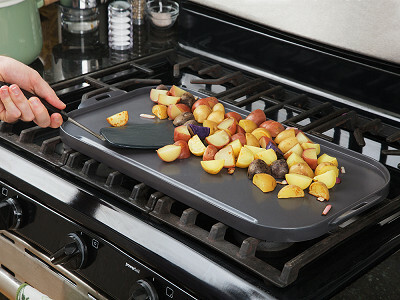 Our ceramic supplier does not use any lead or cadmium in formulating the ceramic, and we knew from the moment that we began to develop this product that if Little Griddle was going to come out with a non-stick product, it could not contain anything that we would not want to eat from, or that would not be compatible with higher-temperature outdoor cooking. Just curious if you plan or have other All-Terrain land other than the 12" skillet and Ceramic Double Burner Griddle available? Also how heavy are these pans? 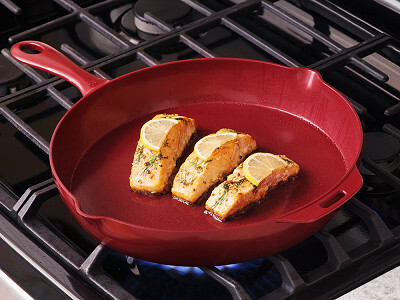 Hi @Teri - Right now The Grommet is carrying the 12" skillet in two colors and our double-burner griddle. We do have plans for more items, and in the future we hope to launch them right here! ANYWARE is super light! The skillet weighs less than 2.5 pounds (you can compare this to more than 8 pounds for a comparably-sized cast iron skillet). The double-burner griddle weighs 3.9 pounds. Thanks for the questions! The skillet says it's 12", I would like to know how deep it is and what is the highest oven setting that can be used? Thank you. Hi @Susan - The skillet is just under 2-inches deep. All of these pieces are heat-rated to 525° F (270° C). We don't recommend putting them under the broiler because it is capable of easily reaching much higher temperatures than 525°, but oven settings are equal to what you could use on the grill. @Jon You say the pan is 2' deep. Is that is inside or outside measurement of the side of the pan? In other words, does that measurement include the thickness of the base of the pan? Hi @Diane - The exterior of the pan is about 2.06" from the top of the sidewall to the bottom of the pan. The interior is about 1.9" from the cooking surface to the top of the sidewall. The thickness of the pan varies depending on the location, because certain areas need to be constructed differently. Thanks for the question! Do they come with lids? Its hard to find lids for skillets that fit and I like to steam/fry my veggies and steaks cook inside faster if there is a lid. Hi @Susan - I agree with you that it's really useful, and we will have lids available for this skillet in the near future. It's on its way! Hello! I do a lot of camping and my cast iron skillet goes everywhere with me. However, it gets very heavy, so its hard to transport and gets even heavier when using it on the campfire when you add all the food. How much do these pans weigh. Are they lighter than cast iron? Hi @Mary - One of our main goals for ANYWARE was that it be easy to pack for camping and tailgating, or for anyone who prefers lighter-weight cookware but does not want to compromise on quality. Cast aluminum is an awesome material for this purpose because is lightweight and strong, and because it also heats quickly and evenly. The ceramic coating creates a terrific cooking surface. 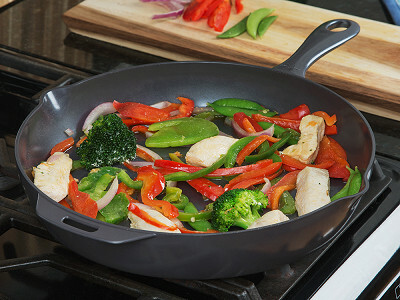 Our ANYWARE 12" skillet weighs less than 2.5 pounds, while a comparably-sized cast iron skillet is more than 8 pounds! The double-burner griddle weighs only 3.9 pounds. The fact that we can get strength and light weight from a product that is so great to cook with makes ANYWARE really fun to use. Thanks for the question! Appears entirely same color. Is exterior easy cleanup ceramic and "scatchable"? Hi @et - ANYWARE is fully coated, and so the same care instructions apply to the exterior. Ceramic is very durable and hard, but metal will scratch it, which is why we machine the coating off of the bottom of these pans. We did not want material on the bottom that would be worn off during use. The cleanup is very easy with soap and water, and even soot from campfires washes off very easily. Thanks! These look like really nice pans! I love the colors. What is the best way to clean them? And do they ever need to be "seasoned" like cast iron? Hi @Kellie, thank you! We recommend soap and water cleanup with a soft cloth or sponge. The full care instructions are in the manual that comes with the product, but ANYWARE cleans up extremely quickly and easily. No abrasive products are necessary or recommended. With regard to seasoning, we recommend that before using ANYWARE, you wash it with warm soapy water, and then season it by lightly rubbing cooking oil onto the nonstick surface over medium heat for 2 minutes. After it cools, wash it with mild detergent and warm water and rinse clean. You’re ready to cook! What is the maximum oven temp for the pan? Hi @Alison - ANYWARE is heat-rated to 525° F (270° C). We don't recommend putting them under the broiler because it is capable of easily reaching much higher temperatures than 525°. Thanks! Can these pans be used on an induction cooktop? Hi @christine - ANYWARE cannot be used on induction cooktops. It is made for grill, gas- or electric-stovetop, campfire, and oven. We do hope to have induction-ready cookware from Little Griddle in the near future! Thanks! Is the Little Griddle dishwasher safe? Hi @Heather - ANYWARE should not go in the dishwasher, but cleanup is extremely quick and easy with soap and water and a soft cloth or sponge. A soft non-scratch scrubber can be used for really tough messes, but we have not found much that is difficult to remove. Thank you for the question! Will the ceramic crack if the pan is dropped on a hard floor? We have had that problem with other ceramic-coated cookware! How thick is the ceramic layer and how robust? Thanks! Hi @Nathan - Great question, and like a lot of things, the answer depends on a few variables - the height of the drop, the surface it falls on, and which point of the pan hits the ground. The ceramic is really durable, and it is very hard - a 9H pencil hardness. That hardness is an asset against wear during use, but if you drop it on a hard or abrasive surface (cement, patio bricks) there is a good chance that you will scratch or chip the coating, as you would with any cookware. The thickness of the coating varies by the area of application, but in general coatings of any kind that are too thick are more likely to fail and peel. The key, which our suppliers are expert at, is applying it with enough depth for durability and enough thinness that it will not run, peel or warp. Thanks for the question! what is recommended for cleaning your pans. obviously non stick safe cleaners but any other specific recommendations or cautions. Hi @Hilary - Thanks for the question! Cleanup is easy on ANYWARE with warm soapy water and a soft cloth or sponge. We recommend a mild detergent such as Dawn or Method, but any non-abrasive dish-washing soap is great. If you have a really tough mess (which is rare), we recommend a soft, non-scratch scrub pad. ANYWARE should not be placed in the dishwasher, and abrasive pads and cleansers are not needed or recommended. Any chance you'll be offering your cookware in PURPLE? :) :) I'd purchase in a heart beat in purple. Also, I'm wondering about storage. I nest my pans - will other pans scratch this one if nested? Hi @Jamie - Great question! One of the cool things about ANYWARE is that we can manufacture it in almost any color, and you will be seeing more from Little Griddle in terms of the colors, shapes and sizes offered on this product line. Cast aluminum can be formed into some pretty great shapes. We will have new color availability next year, and are currently making decisions, so thanks for the vote for purple! Hearing what people want is important while we are conducting our planning process, and I hope that you will be able to buy them right here on The Grommet. With regard to nesting, our recommendation is to place a soft cloth or dish towel between layers of ANYWARE, and we cover this in the instruction manual. The bottom of ANYWARE is machined to remove coating, and so placing it on top of other coated cookware could scratch the other pieces. Thank you for asking! Just wanted to mention they really can't be used on the newest stoves... I have an induction stove... they operate on magnets... and therefore need magnetic pans,,, stainless or copper or such... these wont heat at all. tho they would work in the ovens probably. Just saying , you need to be careful in how you advertise especially in Europe etc..
Hi @jf - thanks for the comment. ANYWARE is the world's first ceramic cast aluminum cookware designed specifically for grill, stove-top, campfire and oven. All ANYWARE pieces are heat-rated to 525° F (270° C), on or with any of these types of cooking surfaces. Induction is certainly gaining in popularity, and we look forward to bringing out induction-capable products in the ANYWARE line in the near future. What is your favorite thing to cook in these pans? I need a dinner idea! - 1 C. dry white wine* (any kind you would also drink with the dish). *If cooking in a skillet, this makes a generous amount of sauce. If cooking on a grill-top griddle, reduce quantities to 2 TB butter, 1 TB olive oil, 1/4 C. wine, as any sauce not absorbed by the ingredients will be lost to the grease well. Chicken or Shrimp broth may be substituted for the white wine. Season shrimp with salt and black pepper (if using). Add olive oil and butter to skillet. When butter has melted and begun to bubble, add shrimp and cook on both sides until they are no longer translucent. Add garlic and saute until fragrant, about 30 seconds. Add chili flakes, if using. Add wine and lemon juice and maintain a high simmer until reduced by half, about 2 minutes. Return shrimp to pan to warm through, being careful not to overcook. Turn off heat, stir in parsley and serve immediately over linguine, bucatini or with crusty bread (and the rest of the wine!). Season shrimp with salt and black pepper. Pre-heat griddle to medium heat for about a minute (350-400 degrees Fahrenheit). Add butter and olive oil to griddle. When butter has melted and is bubbling, add shrimp on both sides and cook until no longer translucent, about two minutes per side. Add garlic and crushed red pepper (if using) and saute until fragrant, about 30 seconds. Add wine and lemon juice and stir to coat shrimp. Cook for one more minute to all the wine to reduce slightly. Stir in parsley and serve immediately over crusty bread or toast. Because there will be less sauce, griddled scampi works better as a sandwich or shrimp toast than as a pasta dish. From stovetop to oven to grill—even on a campfire—this ceramic, non-stick grill pan cooks virtually anywhere. Little Griddle skillets and griddles are made from a lightweight, food-grade aluminum that’s coated with ceramic. The glossy finish keeps food from sticking and it’s easy to clean, too. The designers thought of everything they would want in a pan, then took three years to engineer it. They used materials that would be light but still retain heat and distribute it evenly, whether on your stove or a grill. And they made it easy to cook and to wash, whether you’re indoors or out.